My posts have been a little slow in making their way out to this summer. That’s because my summer was a crazy whirlwind! It was a good crazy. I had the opportunity to take a class that shined a spotlight on the art of playwriting—it was such a wonderful experience! I’ve read a good many scripts before so I thought I was pretty familiar with the mechanics of playwriting. I’ve written lots of stories, so writing a play couldn’t be that complicated, could it? As I was soon to find out, there was more to it than I had thought. 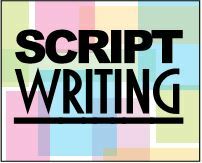 While I’m still in no way an expert on the subject of scriptwriting, I wanted to share some of the techniques from my amazing instructor with you. For the actual play I wrote, I was given very specific guidelines. The scene was to be between 10 to 12 minutes (about 6-7 pages long). It needed to be set in the 1980’s on a high school campus. Oh, and it had to be the first day of school. The story’s conflict had to begin no later than the end of the first page/top of the second page. Ideas began to swarm in my head. A bevy of topics popular in 80’s spilled on to my paper as I began to take down ideas. Then, I looked up popular lingo that was used. I came up with an idea and started right in, but soon ended up trashing my idea entirely. This approach isn’t always recommended, but some first ideas are just born for the dumpster. Our instructor—I’ll call him PI for playwriting instructor—warned us that not every brainstorm is the right one. I then followed his advice to write a paragraph or two about the three most important occurrences in our lives, choose one, and base the scene around it. This got me right on track and I began to devise an outline for the plot. Once we had the basic bones of our story planned out, PI moved on to explaining how to write dialogue. When writing dialogue, he suggested we pay close attention to conversations with our friends, family, enemies, and whoever else we might speak to in our day-to-day lives. He pointed out that no matter how insignificant a conversation may seem every action and word has a motive behind it. PI asked us to pay attention to the conversation the next time we spoke to someone. What did we want them to realize or take away from the interaction? PI also wanted us to recognize that most people don’t try to convince or sway others by stating what’s on their mind straight out. Instead they communicate ideas through vocal inflection, emotional responses, and through body language (the tactics used may be intentional or unintentional). He noted that paying extra attention to body language—it’s super important! It’s one of the most common ways people communicate the truth behind their words. The next area we focused on was revealing and removing masks from our characters as our scenes progressed. An actor’s job is to find the deeper meaning in a character, and likewise, as a writer, it’s important to delve into the minds of the characters and reveal true motives bit by bit. One key note PI gave us: Be sure to write in stage directions when they are of great significance to the impact of the scene. Stage directions can be crucial to a storyline. As the playwright, I found it difficult to balance this. At times I provided too much stage direction leaving little for actor interpretation, and then not enough direction when it was needed. Another point to keep in mind is that stage directions might need to change depending upon the space where a scene will be performed. Eventually, my entire scene came together. I felt pretty nervous about it, and wondered what PI would think. To my shock everyone liked it!! And the best part of writing a scene… getting to tailor-make one of the roles just for me (you know, it’s what Carol Burnett used to do!)! What a magical feeling to see something I created come to life on stage with breath, depth, voice, costumes, sets, and lighting. -A teen who like to shimmer, shine, sparkle, and glimmer!